Transport giant SMRT could face a fine of up to $50 million following the massive MRT disruption on Tuesday, according to a market analyst. More than 250,000 commuters were affected when train services on the North-South and East-West lines were disrupted for over two hours - in what was likely the worst MRT breakdown ever seen here. Maybank Kim Eng analyst Derrick Heng noted that new regulations approved in Parliament in February last year have given the Government expanded scope to hit transport firms with heavy fines for travel disruptions. The maximum fine was increased from $1 million to 10 per cent of the operator's annual fare revenue for the affected line. Mr Heng said in a note that SMRT's rail revenue was $644 million for the North-South, East-West and Circle Line services for the 12 months to March 31. "This suggests a maximum fine of $64.4 million for its entire network. As the latest disruptions did not affect the Circle Line, we reckon that the maximum fine for this incident could be closer to $50 million," he added. The fine could push SMRT's net profit below the $119.4 million that Maybank Kim Eng forecast for this financial year, Mr Heng added. SMRT shares have been sliding since Tuesday's breakdown, losing 0.5 cent or 0.34 per cent to close at $1.48 yesterday, down 3.9 per cent for the week. IG analyst Bernard Aw said investors are worried, not so much about the potential fine - which may end up being quite manageable - but about the future hike in maintenance and operating costs. "The breakdown reminded them that SMRT is under huge pressure to invest in system maintenance and expansion, including buying new trains. That does not bode well for the company's profitability," he said. SMRT's operating expenses rose 4.5 per cent to $1.17 billion in the past financial year, an amount that is going nowhere but up. "There is a need to increase operating expenses to cater to the enlarged fleet of trains, expansion of the network with the commencement of Tuas West Extension operations in financial year 2017, and intensified repair and maintenance works for the ageing rail system," SMRT said in April. As SMRT struggles under the burden, the Government may step in to speed up the operator's transition to the new rail financing framework (NRFF). Under the framework, the Government will own the rail system assets and bear the responsibility for capital investments. Negotiations between the Land Transport Authority (LTA) and SMRT over the transition have yet to reach an agreement. "Given the spate of rail breakdowns... some form of government intervention may be needed," said UBS analyst Robin Xie. "One possibility is to accelerate or alter the terms of transition to the NRFF, which would theoretically allow the LTA to inject additional funds for pre-emptive maintenance." 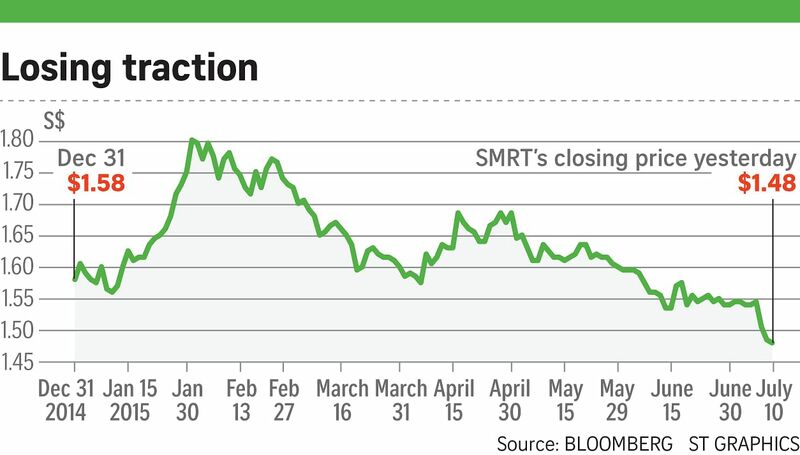 Mr Xie maintained his buy call for SMRT, taking into account the transport policy reforms. Mr Aw agreed it is a much-needed transformation for SMRT: "With a framework like that, SMRT as a company can focus on ensuring service quality and improving profitability."